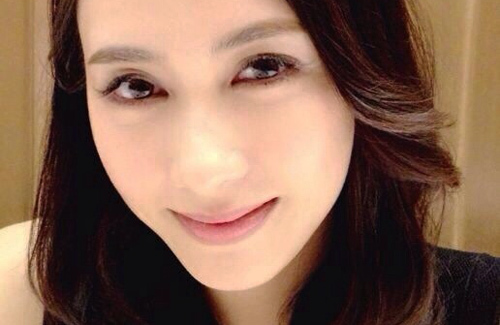 Since marrying businessman Patrick Ma (馬廷強) in 2008, Gigi Lai (黎姿) spends most of her time caring for her family. She is also tasked in taking care of her younger brother, Stephen Lai (黎嬰), who had suffered a debilitating car accident in 2007, and managing his dermatology clinic. Although heavily affected because of Stephen’s car accident, Gigi remained strong for his brother. Singlehandedly managing the business without a complaint, Gigi’s only wish is a speedy recovery for Stephen. Always possessing an utmost amount of hope and optimism for his brother’s condition, Gigi expresses she will not give up. Stephen, as well, maintains a bright outlook on his health, smiling and answering questions with a positive attitude when they were spotted shopping in the men’s section at a department store earlier. Also a loving mother, Gigi was seen with Patrick and their twin daughters waiting in line for hours at a new Hello-Kitty-themed restaurant. Since their daughters, Patricia and Gianna, are fans of Hello Kitty, Gigi and Patrick brought them to the popular new restaurant. The twins started whining after the long wait, and the family eventually gave up standing in line. After driving Gigi and the twins back home, Patrick personally went back to the store to order take out for his daughters so that they will not be disappointed. Besides Patrick, many artistes in the entertainment industry are prime exemplars of devoted parents. When Hacken Lee’s (李克勤) son, Ryan, enrolled in an international school, he purchased a $54 million HKD complex near the school so Ryan would not have to suffer from long car rides. To ensure that he does not wake his daughter up from her sleep, Andy Lau (劉德華) wears headphones whenever he watches TV at home. Hope Gigi’s younger brother gets well soon. I admire these two. Wish them the best! I remembered those comments (still some! ), but I’m glad things are working out for them. Happy for Gigi! “Gigi is a gold-digger, marrying Patrick solely for money”. Just because Patrick looks old and is a cripple, those people see him as having no other virtue/advantage except his money. Glad that the couple prove them wrong. Yes totally! You can see that Gigi is really happy and blissful from the inside out.. Such a low profile and humble couple! We need more of these two! Agree.. I like the two of them.. he is such a nice guy to her and she take care of him and the family. Happy for them for sure. Yes, remember reading so much awful news back then that she married this man for his money. No doubt all these beautiful actress like Gigi Lai, Michelle Reis married into all these rich families for money. But we’ve to try to understand Gigi Lai is a person that sacrifice a lot for her family especially her only brother. One must remember if I remember correctly that her brother has to live with life’s support, without money you think that can be achieved? How much money can she earns by acting? Anyway, I’m truly happy that eventhough her husband has disabilties, he really loves her and she’s happily married now. I honestly like her a lot. Poor Stephen…Wishing a speedy recovery for him! Nice family though. Wish for the best. Wish her brother will be recover & live healthy. Awe, it’s cute and she seem to not age a bit either. And every time there is news about Gigi, her brother is always mentioned. I like her perseverance for staying strong and running his clinic while he is going thru a less than fortunate time in his life. I thought Gigi had three girls??? Love their twins’ names: Patricia for Patrick and Gianna for Gigi. i didn’t notice that .. smart! i like that! oh of course!!! I didn’t realize it until your comment. love it too! Omg i finally noticed.. Gigi – Gianna, Patrick – Patricia!!! Always like Gigi Lai, happy that she’s blissfully married. …., Gigi only wishes for a speedy recovery for Stephen. Wow didn’t even realize she was that old already! She looks great for her age. Yes, I’ve always like her, natural beauty.